After being inspired by a speech he gave about gratitude earlier this year, Esma Karuv ’19 chose to interview High School Math Teacher and cross country coach Mr. Tommy Manning, who started at TASIS in the fall of 2017. Mr. Manning previously taught math and science at boarding schools in Massachusetts, Utah, Minnesota, and Colorado. He earned his B.S. in Chemistry from the University of the South, where he was a three-time All-Conference/All-Regional cross country runner and an Academic All-American. 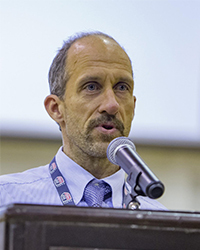 In the interview, Mr. Manning explains why he feels so fortunate to be at TASIS. I had the opportunity to interview Mr. Manning and ask him some personal questions in hope of writing a worthy article about his life and his journey to TASIS. Ever since Mr. Manning's beautiful and impactful speech on Thanksgiving, I had my mind set on getting to know the person who shed light and realization onto so many students. I remember his speech and the state it left me in. I felt almost ashamed at how I saw my life. The lesson I carried through his speech was to stay aware of the life I have and to know that my “bad days” are not bad. At all. Through his words I found more knowledge of the world and more recognition of the way life here is truly a blessing. I was in awe of the way I saw what I was given and frustrated at myself for disrespecting my gift. His words carried a strong emotion into my soul, and I made it my goal to write about Mr. Manning for my interview assignment. I am so thankful I did. Before I dive into my interview with Mr. Manning, I just wanted to add my own anecdote about my first impressions. As this was my first interview, I felt quite nervous and unsure about how the whole sit down would play out; however, meeting Mr. Manning set me at ease, and all I needed to do was listen. As I was listening to Mr. Manning tell me about his life and his values, I couldn't help but be grateful. There are people in this world who bring out the good in people and inflict good thoughts, and as I listened, I thought solely of happiness and peace. Mr. Manning carries the aura of humility, respect, and thankfulness. His advice has stayed with me, and I hope it will also have an impact on you. I was born in Michigan, but my parents moved with my sister and me to Oklahoma, where I was raised in Tulsa. Growing up in the city, I attended public schools my entire life and graduated from a high school in Tulsa. Later I went to college at The University of the South in Tennessee. I was raised in a very blessed home and grew up in a good family environment. Not just my family but the whole neighborhood was fortunate and stable both financially and in the household. None of my friends had divorced parents. In my neighborhood there was no crime. You never heard about people going to jail or murders—it remained quiet and safe. It was entirely middle class. I define class by the cars you see in people’s driveways. A lot of people tend to say they are middle class...but they drive fancy cars. There were no fancy cars in my neighborhood—if anything maybe someone had a cadillac, and even so it was probably used. When someone in my neighborhood got a new car it would be a new USED car. My community had no two-story houses. It was simply middle class—not upper class at all. I always loved playing sports. As a kid I played sports every season, including soccer, basketball, baseball, and football. In high school I mainly directed my athletic amusement toward running and swimming. In all, I played baseball for one year, swam for two years, and ran cross country and track all four years. These became my main sports. It’s gorgeous here, I have a great job, and we have great students around, so if I'm having a bad day here, that's not nearly as bad as someone who has a bad day and who also lives in poverty—someone who doesn't have enough money to put food on their table. In school I was always good in math and science and had a natural love for them. I was the one who found most humanities to be very difficult. History was not all that easy for me, and analyzing books, poems, and passages was very challenging. Learning foreign languages was also a great challenge. As a result, I focused my main attention on math and science and steered away from the humanity subjects. In high school I thought chemistry was the easiest subject I took, and because of that I decided to pursue chemistry in college and ended up majoring in it. During my junior year of college, however, chemistry got very difficult. I knew I did not want to be a chemist for the rest of my life, so with the help from my dad I looked into becoming a teacher. My mom was a teacher and my sister was a teacher, and I knew that I did not want to go back into school for another degree either. So I decided to try being a teacher, and I told myself if I was not happy and did not like it, I could always go back to school and do something else. I started off as a chemistry teacher, but halfway through my career the school I was teaching at needed a math teacher, so I switched into math. Since then I have always felt a calling for teaching, so here I am. We became fast friends and kept in touch annually. We ran together whenever he returned to Colorado for the summer. A year later I met [High School Math teacher] Danny Schiff, and the three of us went on runs together. I stayed in touch with them throughout the year and later found out that TASIS had an opening in math. From talking with both of them the previous summers, I was very interested in TASIS. Leaving the states was not what I thought it would be. I expected the move to be difficult, but it was actually very easy. When applying for the job, the Headmaster gave me 24 hours to decide. I asked for 36. I had to decide really quickly. Once the offer was on the table, I had to go through a Skype interview with [High School Academic Dean] Dr. Mark Abisi and then with [High School Math Department Chair] Jim Shields...before I had time to think about the whole decision. Of course I ended up accepting the job, and the next step was to get rid of all my stuff. I wasn't going to bring random house furniture. So I sold everything I owned and gave some things to thrift stores. At TASIS not only do I teach math, but I work as a dorm parent here for the De Nobili boys. I live in Scuderia. At TASIS there are some major differences in dorm life compared to my old boarding school. TASIS is way more strict with room inspections and study hall procedures. We watch all the boys during study hall for the whole time. It is very structured. We keep an eye on all the students. Also with uniforms. I like it better here. Another major difference here is that Monday through Thursday students cannot leave campus. And on weekends when students leave, they can only leave for four hours at a time and have to sign out with the person on duty and say where they are going and how they are getting there. But here you can just get on a bus and go downtown, whereas at my last school there was no way that would have been possible. The major difference in boarding life, supervision, and procedures at my old school was that we controlled where students would be at all times. I felt bad for the students. It felt too much like big brother. We always had to know exactly where they would be. I didn't like that. So one school is stricter about study hall and room inspection while the other is stricter about leaving campus. Students in Switzerland and the US are not too different. I’ve learned that teenagers are teenagers regardless of their nationality. When you’re focused on your job or your school work, it’s very hard to just stop and take a minute to think about what you’re grateful for. But any time you’re in a bad mood, or any time something bad happens or something doesn't go your way, if you just think about what you have in your life compared to others, everything is put into perspective. It's not like we can reflect on our life all the time, but when we can sit down and reflect and put things in perspective I think it makes it a lot easier to realize that our bad days aren't all that bad in the big picture. And I used the word love. The transition to TASIS was smooth and easy and wonderful. I am so happy to be here. It is a true blessing.